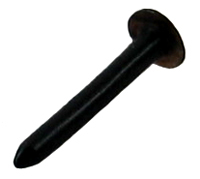 This spiked horn labret plug is a great piece of jewelry for your labret piercing. Water buffalo horn labret jewelry is handmade in Indonesia. Rather than mass-manufactured, these Labret pieces were carved from natural materials, so some variation (such as color, texture and size) is present from piece to piece. 00 gauge (+$8.00) 7/16 inch (+$10.00) 1/2 inch (+$12.00) Select your gauge size and click "Add to Cart".